If you don’t know about Startup Health and you’re a healthtech investor or entrepreneur (or at all interested in the space,) you need to rectify that. After all, as evidenced by the launch of another solid, differentiated health-focused startup accelerator last week, there is a lot of public, private and entrepreneurial attention shifting to the industry. Compared to the majority of business incubators, Startup Health has an unusual model, as it doesn’t offer seed investments and its startups stay enrolled in its program for three years. Rather focusing on demo days or seed rounds, Startup Health wants to help founders build a sustainable, growth business by providing a support structure, classes, courses (and a structured curriculum), a collaborative peer network and access to potential partners, customers and mentors. The accelerator also works with sponsors, like AT&T and the California Healthcare Foundation, to provide scholarships that help cover the costs of the program. These sponsors and partners also provide potential funding channels for startups, as many of them operate in the space and can help provide beta testers and capital that allow teams to test products and models. Startup Health takes two to ten percent equity in its companies, determining its stake based on how much it can improve their key metrics over the course of the three-year program, like revenue, team size, partnerships, key customer relationships, product success and fundraising. Last month, Jordan sat down with Startup Health co-founder Unity Stoakes to dig into the accelerator’s model and discuss, among other things, its addition of 12 more startups to its roster, bringing the total to 22. Now, even if you’re a naysayer and don’t find much in Startup Health’s arsenal to write home about, it’s hard not to see the value in the accelerator’s latest announcement. Today, Startup Health opened up access to the “Startup Health Network,” a platform designed to help improve access to capital, customers and resources — both for healthtech entrepreneurs, investors and knowledge seekers. 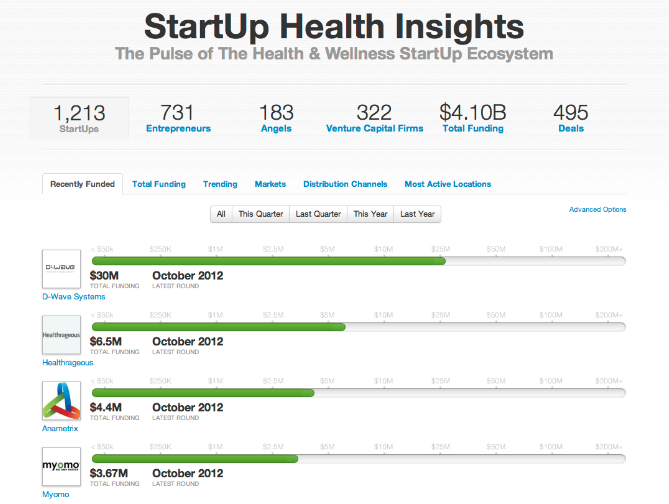 Said in a sexier (and perhaps more telling way), the Startup Health Network is basically an AngelList for healthtech. With a splash of CrunchBase. At beta launch, the network features more than 1,200 healthtech startups, 700 entrepreneurs, 400 VC firms, 180 angel investors and a litany of customers, partner organizations, payers, providers, pharma companies, foundations, etc. On top of that, and hence the CrunchBase comparison, the platform features a funding database that is tracking over $4.1 billion in healthtech investments and currently lists over 500 recent health and wellness investments. Plus, all users has access to the funding database, which means they can also view the deals, trends and profiles featured on the platform. Like CrunchBase, AngelList (and more recently, Rock Health), users can segment the searchable database by date, stage, etc., however, it goes one step further than CrunchBase, allowing you to break that data down by “education,” “eCommerce” or “health.” Startup Health does the same and aims to become an equally valuable resource by not only providing market and funding info, but by connecting founders with potential customers, investors, partners — anyone looking to support the growth of young, up-and-coming healthtech companies. The company’s newly-launched network is free to any entrepreneur, startup, investor or organization in the health and wellness space, Stoakes tell us, but it ain’t no free-for-all. Stokes said that the team will be curating its network to limit the amount of noise, spam and junk living on the platform. This means that, initially, the network will be invite-only, so users have to be invited by Startup Health, one of its entrepreneurs — or they can request access on its homepage after taking a pledge. Users are then verified and can claim and modify their profile. 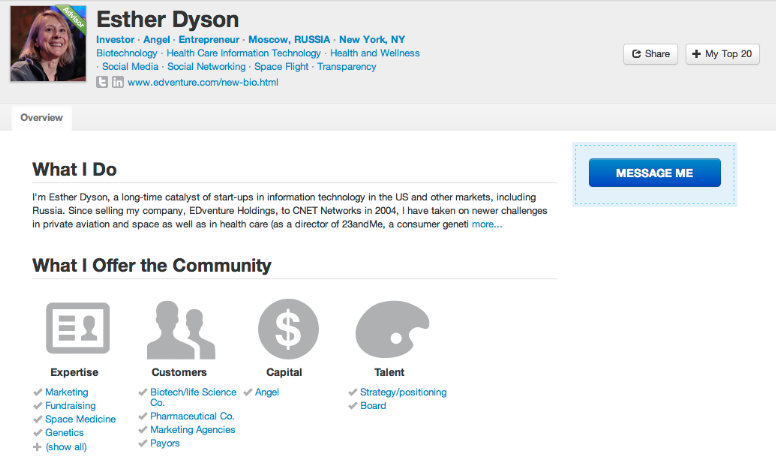 As to use cases: Esther Dyson, a serial investor (especially in healthtech) and investor/advisor to Startup Health, said that she has been using the network to organize her investments, connect with startups and discover new companies. “The platform makes it easy for entrepreneurs to understand what I’m interested in and for me to quickly learn about what they’re up to,” she tells us. And for startups, being able to connect with and learn from investors like Dyson can be huge. In this way, the network provides a similar value prop to AngelList, but it also starts to become a vertical-specific professional networking tool — a LinkedIn for health that comes with the added benefit of giving founders visibility into the health landscape, including fundings, investors and educational resources. The network also offers users the ability to message each other, but this functionality is only granted once a member completes their profile. At that point, as mentioned, users can go in and customize their profile, adding fundraising snapshots for their business, what kind of partners they’re looking to connect with, while investors can give startups a glimpse into their areas of focus, sharing images, documents, investment info, professional history and so on. Going forward, Stoakes tells us that the network wants to continue adding value to the ecosystem by providing entrepreneurs with, say, strategic thinking tools, like, “here are the ten things you need to do to drive equity growth,” or by sending them an email blast at the beginning of each day that highlights the areas they should be focusing on in order to drive value for their business. The more data the network collects on startups, founders, investors and organizations, the better it will be able to target its connections and introductions. 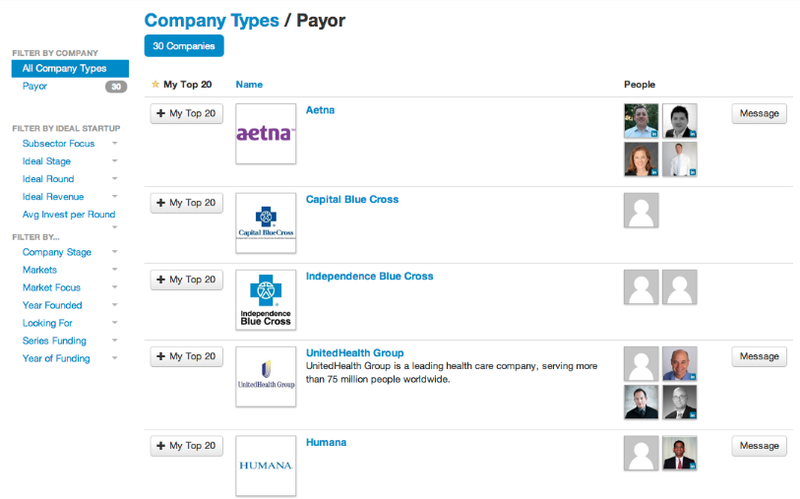 Eventually, Startup Health wants entrepreneurs to be able to connect to the network, where a list of the “30 companies interested in doing business with them” will be waiting for them. It’s features like these that have the potential to turn the Startup Health Network into an valuable resource for the space and the ecosystem at large. Helping to speed up the cycles of innovation by enabling startups to promote their business and connect with investors and customers is an important mission any way you slice it, but it has even more relevance in an industry that is rife with complex and user-un-friendly systems, legacy vendors and bloated incumbents. Resources like the one Startup Health launched today help grease the wheels of this rebuilding process, and, in the long-run, that’s good for just about everyone. More on Startup Health Network at home here.